Peach! It’s a new emoji-themed social network for iPhone that has probably already ridden its headline-driven hype wave to the ground. But that doesn’t mean it isn’t interesting. For real, I’m not even going to entertain the idea that Peach has a chance of taking off. It’s not particularly intuitive, it doesn’t offer a killer new feature that is easily explained, and social networks aren’t where the world is heading — messaging apps are. That’s why it was never actually downloaded by that many of us. If a serious amount of people — more than say, Ello — are using it in six months, I will eat a newspaper. Yet, even without users, Peach is worth looking at seriously. Indeed, I hope some of the people at Facebook Messenger — an app that does have serious numbers — are watching closely. Some of the “magic words” you can use to post in Peach. Peach’s only real innovation is the use of certain trigger words which add content or context to your update. 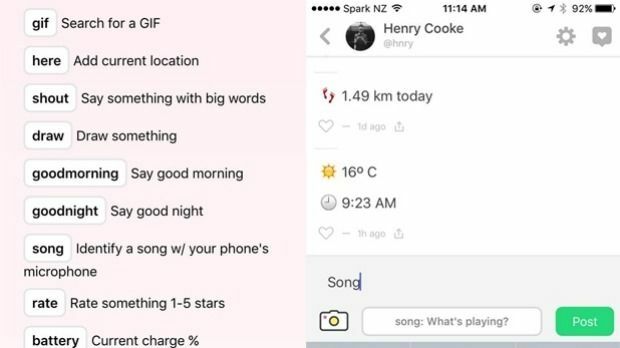 You type “song” and it listens to hear what music you’re listening to, then posts that. You type “weather” and it pulls in the weather with a nice little emoji. You type “battery” and it posts your battery percentage (again with an emoji). You type “draw” and it brings up a pad for you to draw on. You get it. These magic words make use of all the ambient information your iPhone is already collecting on you — if you type “move” it will show how many kilometres or steps you have walked that day. The process of discovering what all the things you can type do is a lot of fun. These kind of typed triggers are in no way new. As Brian Feldman writes in New York magazine, they actually harken back to the command line interfaces of old, which many programmers still swear by for productivity. “The text field is key. It’s partly the solution to a problem that has long plagued mobile developers: Less screen real estate means less space to present interaction options to the users. But it’s also that, for the first time, engineers and developers are creating products for a population that’s truly digital native — for whom typing comes naturally and for whom digital actions don’t need to be metaphorised,” Feldman writes. Essentially, we don’t need to be coddled by a world of icons and metaphors like we used to be. Typing out what we want is intuitive. It’s already how a lot of us get around our Macs (command-space-type-what-you-want), and has proven immensely popular on business-messaging platform Slack, where there are apps that let you order food by typing a number. Facebook have been trying to make Messenger a “platform” for a long while, following the example of Chinese messaging giant WeChat. They’ve built in gifs, location sharing, and even Uber ordering. Yet these options are mostly hidden behind an ever increasing array of tiny tappable buttons — they’re not quite intuitive yet. There’s a lot of ambient information your phone is already collecting. You could type “location” to show someone where you are, “battery” to convey the urgency of a situation, and “weather” to make them jealous. Contextual data is already used for “filters” on Snapchat. Why not add it in as typeable on Messenger? There’s a very good chance Facebook are already well on the way to implementing this kind of thing themselves. Their AI service “M”,which should be able to do pretty much anything and everything for you, including book plane tickets, is interacted with by typing. Bots have been taking over our interactions for a long while now, just as people have been predicting for years. Where they got it wrong is how we interact with them — using your voice is fun, but slow. Typing is exact, quick, and takes far less power to process than voice. It makes sense to take advantage of that.